The new Standard for HCU Color doppler advanced level hcu with 15" touch screen monitor and 2 transducer sockets. 64 phys. channels, 8.5 imaging levels, compatible to HD probes. The SonoScape S8 includes standard advanced imaging configurations including: TEE, high frequency phased array and linear transducers, obstetric 4D, and more. 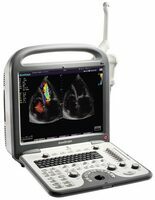 The S8 sets a new standard for performance, value, and image quality in the color Doppler hand carried ultrasound market. Its performance and features are equal to many expensive cart-based systems and includes standard advanced imaging configurations including: TEE, high frequency phased array and linear transducers, obstetric 4D, and more.